If you are paying attention to events here in the U.S. and around the world and are growing uneasy with the potential for harm to come to you and your family, join the club. Maybe, like me, you are or are becoming serious about concealed carry. From the perspective of someone who has carried 7 days a week, close to 16 hours a day for over 7 years now AND who has trained over 7,000 others in the Texas Concealed Handgun License Course, I can tell you how to do it. First, get the training. The Concealed Handgun License Course is the minimum. If you can take advantage of other courses, I would start with the NRA’s Personal Protection Inside the Home and Personal Protection Outside the Home Courses. You can find times and dates for these courses here in the North Texas area at http://www.trainersgroup.net. Start reading. As a minimum you should read The Gun Digest Book of Concealed Carry by Massaad Ayoob. In fact, read anything and everything by Massad Ayoob you can get your hands on. As far as periodicals go, American Handgunner and Combat Handguns for starters. I actually read pretty much anything on Walmart’s magazine rack that relates to firearms. I also suggest you join the NRA and get their monthly magazine American Rifleman. You need a good carry gun, at least one. I’m NOT talking about a little pocket gun. I’m talking about a gun that can get you out of a scrap, one that can stop a fight. I can vouch for the following: Sig Sauer SP2022, Sig Sauer P226, Sig Sauer 1911 Carry, Beretta PX-4 Storm, Taurus 24/7, Stoeger Cougar, S&W M&P, S&W 1911 Commander, Springfield XDm, Springfield 1911, Remington R1 Carry, Ruger SR 1911 Commander. Some of these guns are 9mm, some are .40 S&W and some are .45. For the past 3 years it has been rare that I’ve carried anything other than a .45. My preference is for a Commander-Sized 1911. I have several that I have 100 percent confidence in because I’ve wrung them out at the range with various types of carry ammunition without a single failure. You MUST have confidence in your gun with good Defensive Ammo. That means either Jacketed Hollow Point ammo or an expanding equivalent like Hornady Critical Defense or Federal Guard Dog. DO NOT carry FMJ (ball ammo) in your defensive handgun. There is too much chance of over penetration which could harm an innocent bystander. For the most part I use Hornady Critical Defense, but I also have a lot of confidence in Speer Gold Dot, Remington Golden Saber and Sig Sauer Defensive Ammo. 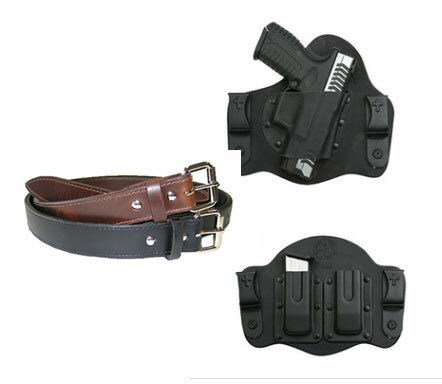 Get a good IWB holster with multiple mounting points (Crossbreed SuperTuck, Alien Gear, White Hat Holsters). Buy some pants with either an expanding waistband or that are an inch or two larger in the waist than you usually buy. I’ve written about holsters before, so go back and review some of my previous articles for details if you need to. For a good holster you will need to custom order one that fits your gun from one of these places. Although I like Crossbreed and continue to wear their holsters, Alien Gear makes a great holster for less money and I can’t tell the difference when wearing one of theirs. I’ve had friends get by with less expensive holsters, even minimalist holsters, but they don’t really carry full-size guns or wear them all the time. If you’re going to be serious about Concealed Carry, be serious about it. Don’t leave your gun at home or in the car. Carry it with you every where it’s legal to carry. I find that I very seldom have to go someplace where it’s not legal, so I’m pretty much armed all the time. When you get your belt and holster rig, practice drawing from it – a bunch. I draw from my holster several times a day. I practice drawing so often that my gun is out and on target quickly and my sights fall right where I want them to. Carry spare ammo. See the IWB mag carrier in the photo above. That’s Crossbreed’s offering. I always have at least one spare magazine on my support side. If you are a Sheep Dog, you have got to be ready. You’ve got to be paying attention to what’s going on around you, always alert. You need to be skillful with your firearm and you need to keep it loaded and ready. If you follow the steps I’ve outlined above and find that you can’t carry comfortably, come see me and I’ll buy your belt and holster from you.